Stainless Structurals America produces large volumes of structural profiles for the architectural and construction industry, mostly for curtain walls and façade designs. Stainless steel plays a major role there. We can produce all types of tailored stainless shapes used for curtain walls and special profiles for façade work. The three most common sections for these applications include hollow sections like square and rectangle tubing, T-sections, and free form custom profiles. All of these sections are available in 304L, 316L, Duplex and many other stainless alloys. Nevertheless, we can even produce these same sections in carbon steel at our parent company, Montanstahl, in Switzerland. Our square and rectangle tubing is a very popular design for curtain walls and facades. This is because of the square corners. Conventionally welded tubing is made from carbon steel. This has the inconvenience of rounded corners that can have a radius of two times the material thickness. Our laser fused tubing has true 90 degree sharp outside corners. Due to this, the tubing can also be optimized to meet the desired loads by increasing the wall thickness required. Laser fused T-sections with sharp corners and slim sidelines are the choice for designs where the main objective is to achieve a very basic or minimal façade structure. This lean and strict architectural feature avoids any superfluous and disturbing elements. Custom sections that we produce with laser fusion are the ultimate choice if your curtain wall or façade project requires a “one of a kind” design. This technology allows for designs up to 40 feet in length and up to 40 inches in depth. However, all of our laser fused profiles have sharp crisp corners, clean lines, and smooth almost invisible weld seams. Many architects and construction firms have used our stainless steel sections for their curtain wall designs. Among the most interesting architectural projects we have produced these for the 57 West “Manhattan Pyramid” Building façade, the observatory of the Empire State Building, the lobby of the New York Times Tower, the WTC Transportation hub, the New York South Terminal, and many Apple Stores across the country. 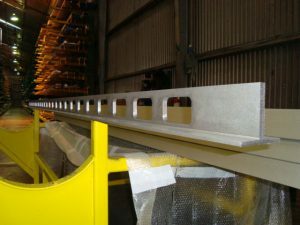 Remember, stainless steel will last a lifetime and our unique laser fused structural profiles comply with AESS guidelines. Please give us a call or visit us online for any of your curtain wall project requirements.